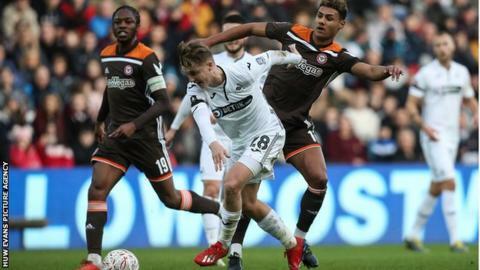 Graham Potter has urged George Byers to prove himself at Swansea City after the midfielder triggered a one-year contract extension. Byers, 22, is tied to Swansea until the summer of 2021 having made the first-team breakthrough this season. The news is not so good for fellow midfielder Leroy Fer, who could face another month on the sidelines. The Swansea captain has been out since January 29 with a hamstring injury and could miss a further five matches. Fer's absence has meant more opportunities for Byers, the former Watford youngster who joined Swansea's development squad in 2016. Last season's young player of the year at the Liberty Stadium has made the step up to senior football this term, scoring twice in 12 appearances to date. "As I understand it, because he has played games George has triggered an extra year so he has a relatively long-term contract with us," said Swansea boss Potter. "He has come in and shown his quality. He has scored and had shots, he has good passing ability, reads the game really well, has a good football brain, can see the picture and make decisions well. "He is just starting in his career. He needs to establish himself in Swansea City's first team, play 50-odd matches, and then you can make an assessment of where he is at."